This is the second volume of McCullough Robertson's Energy and Resources M&A Transaction Guide developed for the resources sector. Recent Australian case law has brought the doctrine of good faith back into the spotlight. This article will give a high level overview of the status of the doctrine of good faith for common law in Australia and will discuss the pros and cons of an express inclusion or exclusion of the doctrine of good faith in your contract. We'll wrap up this second volume of the Guide with a Masterclass in Brisbane and Sydney in 2018 where you can ask our expert panel any questions related to undertaking an M&A transaction. Dates will be announced in 2018, but you can register your interest for Brisbane here and Sydney here. Recent Australian case law has brought the doctrine of good faith back into the spotlight, and has continued to confuse this often misunderstood and misapplied area of law. The doctrine of good faith is a very relevant consideration for M&A transactions. Transaction term sheets and heads of agreement often include a provision requiring parties to act in good faith when negotiating the more definitive transaction agreements. Also, when acquiring an interest in an existing joint venture the acquiring entity will be bound by the terms of the existing relationship document (e.g. a joint venture agreement) and that document may in some instances include obligations to act in good faith when dealing with the other joint venture participants. Even if that document is silent on the issue, obligations of good faith may nevertheless apply in certain circumstances. This article will give a high level overview of the status of the doctrine of good faith for common law (not statute) in Australia and will discuss the pros and cons of an express inclusion or exclusion of the doctrine of good faith in your contract. The doctrine of good faith in Australia remains largely a construct of common law, with the obligation to act in good faith being implied either by a Court at the pleading of an applicant, or otherwise included as an express term in a contract. The recent Victorian Court of Appeal decision in Masters Home Improvement Pty Ltd v North East Solutions Pty Ltd5 (Masters Case) demonstrates the lack of certainty around the concept of good faith. The Masters Case involved a dispute between Masters Home Improvements (Masters), a Woolworths subsidiary, accused of a breach of an express obligation in an agreement to lease which required Masters and North East Solutions (North East) to '... act[ing] reasonably and in good faith ...'6 to resolve differences they may have in relation to certain costs to be borne by North East and the contribution of Masters to those costs. Failure to agree triggered a termination right. After failed negotiations, Masters exercised its right to terminate. North East then brought proceedings, alleging Masters had breached its obligation to act reasonably and in good faith, and arguing that Masters terminated the agreement to lease for other commercial reasons. The trial judge agreed with North East, finding the express obligation of good faith had been breached by Masters and awarded North East $10.875 million in damages. Unsurprisingly, Masters appealed this decision. the steps the trial judge suggested Masters should have taken to comply with the obligation would take the obligation of good faith too far. The Court of Appeal did not agree with the trial judge that the conduct of Masters constituted a breach of good faith. It is worth noting that on appeal the contractual obligation of good faith was not questioned, simply that Masters' conduct did not amount to a breach of that contractual obligation. That said, this decision highlights the risk of relying on express obligations of good faith as the basis for protecting your interests. With the position at law unclear, and restricted circumstances where good faith can be implied into a contract, how this issue is addressed in a contract is fundamentally important. Often, the inclusion of an obligation to act in good faith in performance of a specific clause in a contract or in a contract as a whole can be the result of an impasse between the parties during the negotiation phase. For example, parties may be unable to agree on a market valuation process or option terms, and as such they include a future obligation to negotiate in good faith. However, as seen with the Masters Case, this approach has its risks. 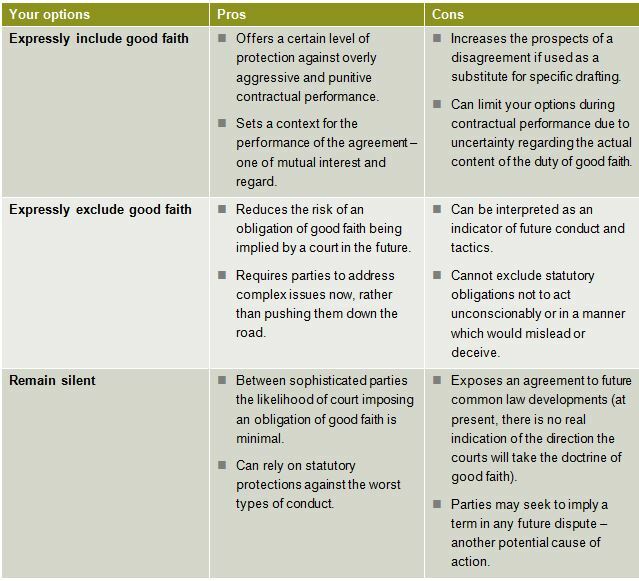 The pros and cons to the various ways in which good faith may be dealt with in contractual arrangements, as well as the general uncertainty in the application of the duty to act in good faith in the context of contractual arrangements means that the consideration of good faith obligations between parties to a contract remains a live issue. A strategy that may offer a commercial outcome is the limited use of express obligations of good faith, for example, including an express obligation to act in good faith in very specific circumstances, or in a specific provision of a contractual obligation. This approach would go a certain way to excluding good faith from the rest of the agreement, while also offering protections afforded by the doctrine of good faith in circumstances where it may be difficult or impossible to remove the risk of the conduct of the other party. Parties negotiating M&A transactions should not assume that there is a doctrine of good faith governing counterparty conduct, and although ideas of good faith may be appealing at the outset of a contractual relationship, in the absence of certainty in this area, such obligations may give rise to unintended consequences.